CCD camera delivers excellent video image to the monitor event in the dark. Audio quality is superior as well. Light and easy to move from room to room, the monitor can receive pictures up to 200 feet from the camera. Connect BabyCam to any VCR to record all on-screen activity. Display the image on a standard TV (with audio/video inputs)for larger screen viewing. Keep an eye on toddlers and older children inside or outside the house. 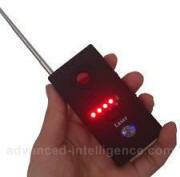 Observe and protect an entrance, waiting room area, or back room operation. 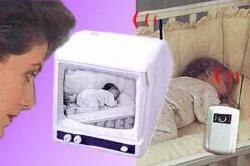 BabyCam can also monitor the sick or elderly. Monitor two locations. 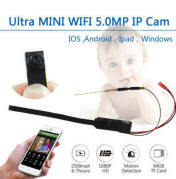 With the purchase of an extra camera, Babycam allows monitoring of two locations (i.e. a new-born at rest and a toddler in playroom).